OCTOBER HUNTERDON HERITAGE/HISTORY HAPPENINGS AND MORE! THIS TUESDAY, SEPTEMBER 20TH AT 7 PM: HISTORY MAPPING: "WASHINGTON SLEPT HERE" with Marilyn Cummings. The telling of 18th-century history using amazing 21st-century technology. A nutshell chronology of the events of the American Revolution as told from the perspective of the common and not-so-common people directly involved… and highlighting some of the captivating places George Washington actually slept! With a decidedly non-military slant, this tracing of people, places, and events during the War will appeal to a wide audience, both men and women as well as older students. Main Branch County Library 7pm FREE; reservations recommended. Refreshments following. ON SATURDAY, SEPTEMBER 24th – THE MOUNT AMWELL PROJECT PRESENTS THE ANNUAL CEMETERY CEMENER, "REST IN PEACE? NOT IN NEW JERSEY! PRESERVING AND PROTECTINGAMERICAN HEROES' GRAVES -- A REVOLUTIONARY IDEA!" Did you know that there is not statewide law that preserves and protects graves in New Jersey?! Our great heroes from the American Revolution, the Civil War, and even of our most recent battles rest uneasy as there is nothing that prevents a developer or land owner from removing or destroying the final resting places of our ancestors or even ourselves in the future. Registration opens at 9:00 am sharp at the Main Branch of the Hunterdon County Library, Route 12, Flemington, NJ for a provocative two part seminar in which the protection of graves is explored. The day's sessions begin at 9:15 am and end at 4:30 pm. After a keynote address by Lance Ashworth, President of the Fishkill Supply Depot preservation project, the morning session is full of informative talks about the lack of legal protections for graveyards or graves. Real case histories of lost or threatened Revolutionary War graves in Hunterdon County will be discussed. At 1 pm, after a lunch break, we will explore what constitutes important criteria to legally protect graves and work in both small teams to hone ideas into legislative recommendations to get our historical graves finally protected and our war heroes resting in peace. A $10 fee covers both morning and afternoon sessions, snacks and lunch. You are invited to come for either session or stay for both. Legislators, their aides, elected official and planning board members are strongly encouraged to attend. To register, please go to the Mount Amwell Project website at www.mtamwell.org. The Hunterdon 300th is sponsoring Hunterdon County museums during Hunterdon Heritage Days 2016 on two consecutive Sundays in September. On September 18 and 25, the public is encouraged to visit participating museums between 1pm and 5pm. This event was inaugurated by the Hunterdon Tricentennial Committee, now known as the Hunterdon 300th, as part of the Tricentennial Celebration in 2014. We’re proud to highlight our rich history by promoting our beautiful Hunterdon County museums for the 3rd consecutive year. Docents will be available to enrich the history and answer questions. A directoryMuseums of Hunterdon County will be available free of charge at each participating museum. The directory is also available on hunterdon300th.org; visitors are encouraged to consult the directory for street addresses and contact information. Several museums will have special exhibits and activities planned for visitors. The Hunterdon 300th headquarters, at the Children’s Choir School 3 Chorister Place Flemington, will be open with information and a sales table. Locktown Stone Church, Delaware Twp. SATURDAY, OCTOBER 8TH: THE LOWREYS TOWN AND COUNTRY, PART I: A TALK AND GRAVEYARD TOUR IN THE COUNTRY: On Saturday, October 8th join us for the first of a two part special event Revolutionary series called THE LOWERYS TOWN & COUNTRY. Our first part brings us to historic Kingwood Towship with a talk a tour by Kingwood Township Historian, Sal DeSapio. We meet at 2 pm at the Old Stone Meeting House, located at the corner of Route 519 and Oak Summit Road for a talk on the history of area where, in December 1778, the Continental Army camped while moving prisoners to Virginia. Following the talk, Sal will bring us to the historic Oak Summit School, a one room school house built in 1754, and then the Oak Summit Cemetery, where the Lowrey family is buried. This cemetery contains the remains of at least four Civil War Veterans and five veterans of the American Revolution. When we return to the Church, we will enjoy special 18th century style treats made by our great friends at Teaberry's Tea Room in Flemington as a preview to our second half of the series. FREE. RESERVATIONS REQUIRED. 2 PM AT THE OLD STONE CHURCH, KINGWOOD. SUNDAY, OCTOBER 16TH: THE LOWREYS TOWN AND COUNTRY, PART II: A BRITISH HIGH TEA IN TOWN: Colonel Lowery married Ester Fleming, the eldest daughter of Samuel Fleming whom the town of Flemington was named. In fact, Esther lived in what is now the Fleming House Museum and Garden on Bonnell Street in Flemington. The Lowreys maintained a home in the Borough of Flemington at the site of Teaberry's Tea Room. On Sunday, October 16th, Teaberry's will host a British High Tea serving a four course meal of period style 18th century foods. Join us for this very special event for all anglophiles, foodies and historians! Often confused with Afternoon Tea, a proper British High Tea is a hearty meal at the end of the day -- not the one served on Downtown Abbey where cake and finger sandwiches are served. Consider this meal your evening's dinner - you will NOT go away hungry! To make the mood all the more Revolutionary, Anne and Ridley Enslow, in 18th century attire, will be on hand, moving about the rooms of the restaurant, serenading you with songs of tea and beverages stronger -- all from the Colonial Period. Teaberry's owner, Susan Peterson will also be on hand to chat about High Tea vs. Afternoon Tea. Tickets are $40 per person which includes music, chat and your high tea. Payment is required within 3 days of your ticket order. 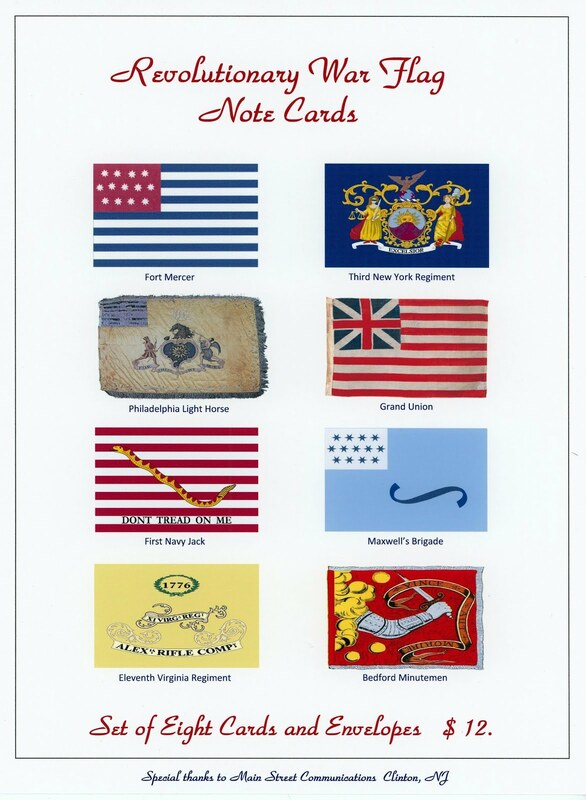 Checks or cash only payable to the Hunterdon 300th may be mailed to or dropped in our mail slot at 3 Chorister Place, Flemington, NJ 08822. This will be open seating and small groups may be seated with new friends and limited to only 50 guests. No jeans please. Teaberry's Tea Room 2 Main Street, Flemington, 5:30 pm. Sunday, October 23rd: In their own words: The Hunterdon Militia in the Revolutionary War: Join Sons of the American Revolution's Mike Alfano for an all new lecture based on the gleaning of history and genealogy from the pension files. What do the pension records reveal about the lives of the men who fought in the Hunterdon Militia? When Mike started researching the topic, one of his original purposes was to uncover "the true story of the gathering of the boats on the Delaware in December, 1776." What does his research show about local hero Daniel Bray? All will be revealed at this talk! 2 pm at the Main Branch of the Hunterdon County Library; Refreshment follow. 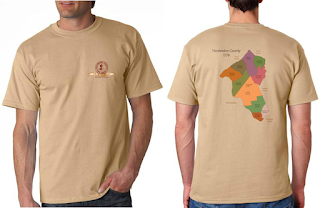 CHECK OUT OUR EXCITING NEW MERCHANDISE CELEBRATING THE AMERICAN REVOLUTION IN HUNTERDON! NOW AVAILABLE AT THE REFERENCE DESKS AT BOTH THE MAIN AND NORTH BRANCHES OF THE HUNTERDON COUNTY LIBRARY! 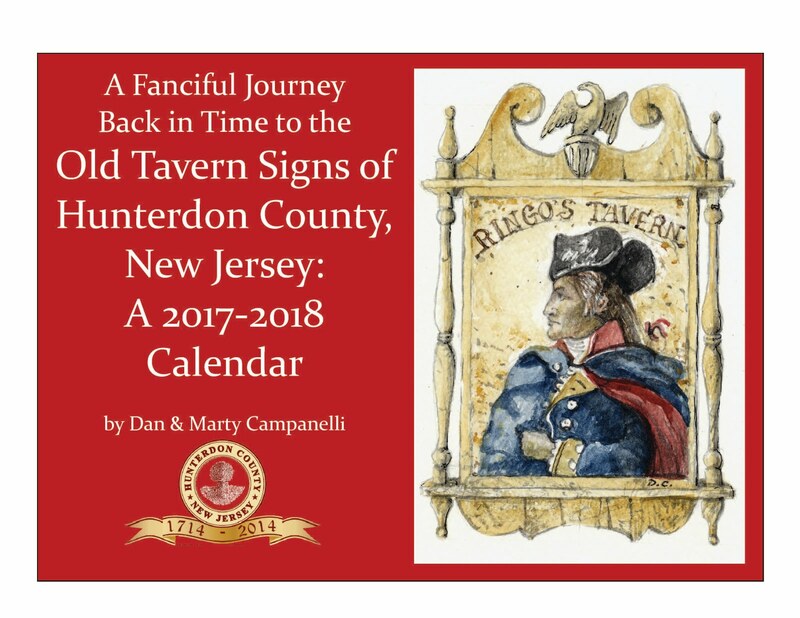 Stunning two year calendar featuring nationally renowned watercolorist Dan Campanelli's artwork of his interpretation of 26 different tavern signs found during the American Revolution. Dan and his wife, Marty, both respected historians, researched the histories of each tavern which appear near the signs. Spiral bound 2017-January, 2019 calendar, $12 each; 2 or more $10 each. 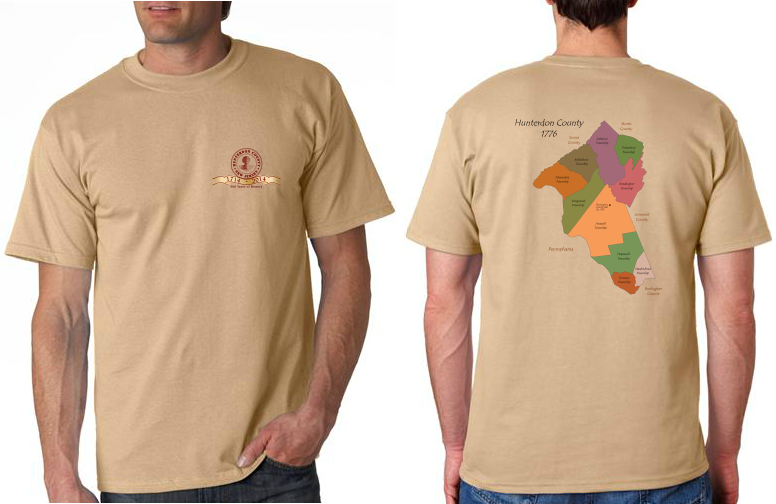 This unique sage colored t-shirt features a map of Hunterdon County in 1776 on the back. Hunterdon County included Trenton as well as the New Jersey landings for Washington's crossings in the winter of 1776-1777. The front logo proclaims 240 Years of Independence, celebrating 1776 thru 2016. Sizes small thru XL: $15; Size 2XL: $17. of Antiques and Olde Household Goods. OCTOBER 2ND: READINGTON OPEN HOUSE AT READINGTON'S 1826 COLD BROOK SCHOOL: The Readington Museums’ Cold Brook School, originally built in 1826, will be open on Sunday, October 2, 2016 and will offer visitors the chance to see what it was like to attend school in the early 19th century. The one room school house is a period correct reconstruction built over the original foundations. The original burned down sometime in the late 20th century. The schoolhouse is only opened once a year when the Museums’ provide a handson school day for all 4th graders attending Readington Township schools. Now, everyone will have the same chance to spend a fun filled afternoon at the school house. Visitors will have a chance to see if they are Abecedarians, try their hand at orthography using a quill pen and ink, solve mathematical problems, and learn some New Jersey history. During recess, visitors can try their hand at playing a variety of 19th century games, including rolling hoops, in the meadow. Apple cider and bread with apple butter will be served. The program will run continually from 1:00-4:00 p.m. with different activities happening at different times. Due to the small size of the school house, groups of four or more are asked to call for a reservation. GPS address is 190 Potterstown Road, Lebanon, NJ 08833. OCTOBER 8TH: BARN DANCE: Put on your dancing shoes for a night of family fun as the Readington Museums hosts its bi-annual Barn Dance on Saturday, October 8, 2016 from 7:00-9:30 p.m. The dance will be held inside the eighteenth century Wade-Wyckoff Barn at the BoumanStickney Farmstead. This family friendly event is a wonderful way to have fun with the entire family. No experience is necessary. Caller Betsy Gotta will give easy to follow instructions before each dance so even a beginner will be able to dance the night away. There is a suggested donation of $5.00 per adult and $2.00 per child. Groups of six or more please call for a reservation, 908-236-2327. Tewksbury Township Historian Shaun C. Van Doren will hold a lecture on the history of the village of Pottersville, followed by a guided walking tour on Sunday, October 2, 2016, beginning at 1 pm. The tour will be cancelled in the event of rain however the lecture will still be held. The lecture and parking for the tour will be at the Pottersville Fire House, Hacklebarney Road, Pottersville. Advance registration is required for the walking tour. To register please call (908) 832-6734 or email tewksburyhistory@earthlink.net and provide your name, phone or email and number in your party. The cost per person is a $ 5 donation with all proceeds going to the Tewksbury Historical Society. Refreshments will be served. Come spend an afternoon in the village of Pottersville. First enjoy breakfast or lunch at the Black River Deli, then listen to an informative lecture on how Pottersville was founded, what life was like over 100 years ago, what businesses were thriving and who were some of the people who lived there. Pottersville is one of those unique places, which straddle three counties and four municipalities. Then take a walk on Fairmount Road West, Black River Road, Pottersville Road and Hacklebarney Road to see some of Pottersville’s historic sites, including Wortman’s Mill and the old Rockabye Baby Railroad station. 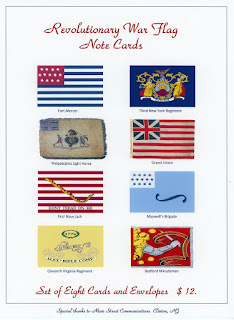 For more information call 908-832-6734 and leave your name and phone number or log on to www.tewksburyhistory.net. OCTOBER 22nd: TEWKSBURY HISTORICAL SOCIETY'S ANNUAL TAG SALE: The Tewksbury Historical Society will be holding its 2nd annual fall Tag Sale on Saturday, October 22nd from 8 am to 4 pm, rain or shine, in its Oldwick Carriage House, 5 James Street in Oldwick. Come view the newly restored exterior of the carriage house and at the same time peruse what the Society has to sell – antiques, china, records, tools, HH items and much more. And the Society will be selling its afghans, cards, and books as well. The Society accepts cash, check, Visa or Mastercard. For more informaton call 908-832-6734 or email to tewksburyhistory@earthlink.net. OCTOBER 9TH AND 16TH: VICTORIAN MOURNING TRADITIONS AND CUSTOMS: During the Victorian era from 1837 to 1901, grieving families often engaged in elaborate customs to commemorate their dearly departed. The Union Forge Heritage Association will explore these long forgotten, and often macabre, traditions and customs with Victorian Mourning themed house tours at our historic Joseph Turner House. Visitors will be greeted by costumed docents and invited to take a step back in time into a Victorian household in mourning. Topics of social expectations, attire, photography, decor and more will be explored and experienced in each decorated room. October 9th and 16th Tours start: 2:00 / 2:30 / 3:00 / 3:30 Admission: $10/person Reservations recommended to guarantee admittance. Contact us at: UFHAevents@gmail.com or 908-713-1439 for tickets and info. ANNOUNCING THE HUNTERDON 300TH'S 2017 LECTURE AND EVENT SERIES: "HUNTERDON AT WAR: THE HOME FRONT FROM THE FRENCH-INDIAN WAR TO THE WAR ON TERRORISM."